Criminals commit crimes. That’s sort of why they’re criminals, it’s right there in the word. But just because someone has taken a few wrong turns in their life, doesn’t mean the rest of their life should be condemned. Removing someone’s freedom permanently doesn’t teach a lesson, it just breeds contempt – same goes for the death penalty, too. Most of the human civilization has already come to this conclusion, but one particular alien, Superman, hasn’t cottoned on yet. Killing criminals is unjust, Superman. In fact, it’s Injustice. Batman knows, at least, and that’s why he and Superman went to war. Batman lost his sidekick, and many members of the Justice League turned their backs on, well, justice, and turned to massacring criminals straight out of their cells. Not sure how killing a bunch of people who were already locked up would help crime rates, Superman. You didn’t think this through very well. Years have passed since the Justice League fell, Superman is locked in some sort of high energy containment field, but that doesn’t mean things have returned to normal – Gorilla Grodd and his society are just the first to move to disrupt peace once again, while Brainiac watches the chaos unfold from on high. The whole story mode, while not groundbreaking, is exactly the sort of fun, entertaining romp that NetherRealm Studios are known for at this point. Cinematics look great, although playing Injustice 2 PC does highlight some compression, and the pre-rendered cutscenes look slightly less crisp than actual gameplay. Not really an issue on a 1080p screen, but if you have a high resolution TV or monitor, you might spot some signs of aging. Story mode has a similar issue with framerate, where both pre-rendered cinematics and the flashy animations for supers are capped at 30FPS, despite the fact that gameplay runs at a solid 60FPS but not any further than that. Yes, that does mean that those of you with high refresh rate monitors are out of luck with this game as Injustice 2 PC doesn’t care how many Hz your display can pump out – it’s not going above 60FPS anyway. The game oddly detects high refresh rate monitors, and in the options panel you can push the Hz up to 144Hz, but the framerate won’t actually go any higher no matter what you might do. A solid 60FPS is recommended for online play, and the game will even benchmark your settings before letting you online, so it might be related to how online games sync up server side. Regardless, 60FPS really is both the minimum and maximum framerate you want to see during gameplay, which is certainly a disappointment for several fans. It would have been particularly interesting to see if the combat system benefited from the extra smoothness. Still, the good news is that the game is well optimized and won’t require mighty hardware to run. It also looks great and supports a few different anti-aliasing techniques to choose from (FXAA, TAA and a mix of the two) as well as HDR10 displays. It’s been a few months since the game released on consoles and now with Injustice 2 PC, you can also pick up the latest DLC characters. Hellboy, Raiden, Sub Zero, Starfire and Black Manta are all available to grab depending on which edition of the game you pick up, and they’re loads of fun. Of course Raiden and Sub Zero are making the move over from the Mortal Kombat series and the feature some mesmerizing supers – Raiden’s being a particular favorite of mine. The DLC roster isn’t complete yet either, with some truly exciting characters on the horizon (Turtles, anyone?). Just as in the console releases, you’ll be fighting opponents online and collecting Mother Boxes to earn new gear and customise your characters. Just as in Tekken 7 earlier this year, customising your characters is fun and feels rewarding, but unlike Tekken 7, you’ll be playing the game for hours before you manage to earn a complete armor set for one of your characters. The ability to change the color scheme of everything you currently have equipped is a nice addition, but a frustration that remains from the console version of the game is having to level up characters before you’re able to actually use the gear you’ve earned for them. Once you’ve got one high level character it’s not a concern, but feels like a time-wasting frustration until that point. 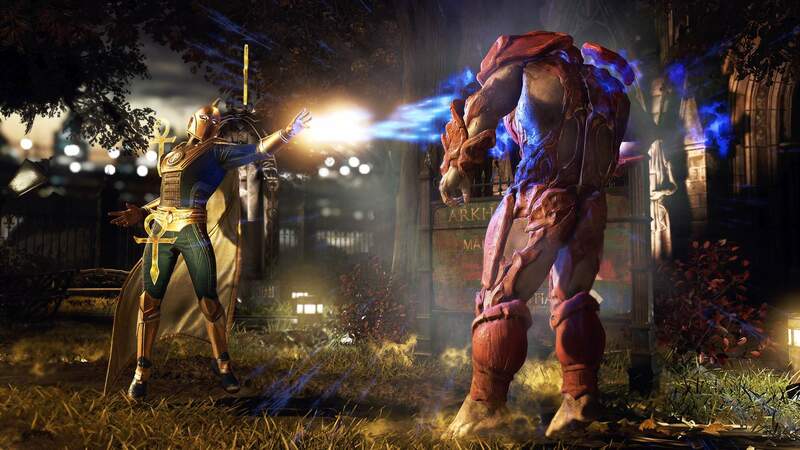 Of course, the most important part of Injustice 2 is the combat, and it’s still just as good as it was on console – Injustice 2 PC even detects both DirectInput and XInput controllers, too, so those of you with either PlayStation or Xbox arcade sticks or pads can still plug in and use them comfortably (though you might need to remap some of your buttons initially). Combat feels weighty; jumping through the air makes you feel like you’ll crash down hard when you land, heavy hits which blow characters across the screen feel satisfying to connect, and those entertaining stage transitions and hazards make each stage more than just a fancy background, but actually something you can interact with. 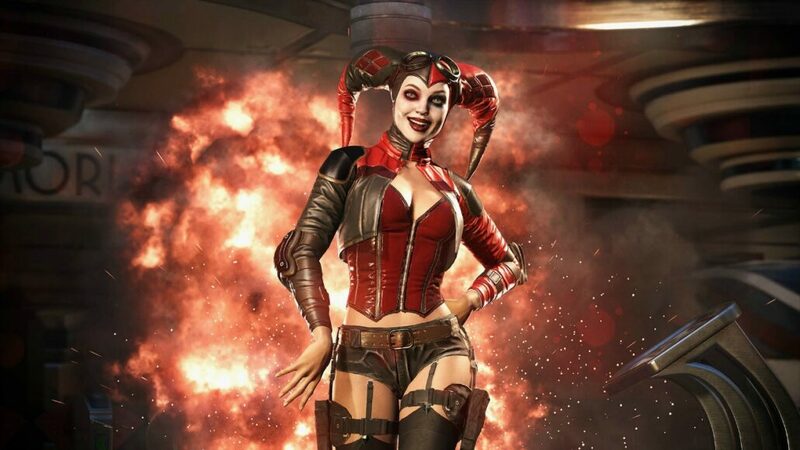 That’s not to say Injustice’s combat is perfect, though. The newbie-friendly Light/Medium/Heavy buttons make it simple for new players to jump straight in and start connecting combos, while the Character button gives a specific move which requires a degree of mastery of each character in order to use properly. It’s a decent system, but it’s difficult for new players to truly judge what sort of attacks they’re going up against. Overhead moves come out too fast and it’s tough to judge what counts as a low for many characters. But ultimately, these are the sorts of things that prolonged play will adjust you to – the question is whether or not you actually want to spend such a long time adjusting. Review code provided by the publisher. You may purchase Injustice 2 PC at a discount via Green Man Gaming. Injustice 2 on PC is a great version of a wonderful fighter and love letter to the DC universe, but some PC players will find the capped framerate to be a disappointment. Despite that, Injustice 2 plays great and looks better thanks to the higher resolutions available on the PC version. If you’re a DC or fighting game fan and have the hardware to output this on High settings, it’s a worthwhile investment.